The Ford Motor Company Assembly Plant is an outstanding example of early 20th-century commercial and industrial architecture in Atlanta. It is one of the earliest automobile assembly plants in the Southeast and represents the beginnings of the automobile industry in Atlanta. As a result of Ford's pioneering decision to decentralize its production facilities, it is also significant for serving as the headquarters of the company's southeastern operations from 1915 until 1942. In 1907, four years after the Ford Motor Company was founded, the automobile maker opened its first small sales office in Atlanta in a converted harness shop. Because of the high volume of sales in the city, Atlanta was selected as a regional branch two years later. In 1914, Ford made the decision to concentrate its sales, service, administration, assembly, and shipping operations for four southern states in Atlanta. At the height of its operation in this plant, Ford sold an annual average of 22,000 vehicles. 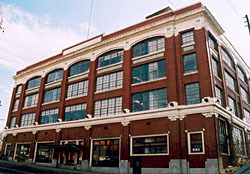 Model T's (1915-1927), Model A's (1927-1932), and V-8's (1932-1937) were assembled in this building. After selling the building to the War Department in 1942, another plant was constructed in the Atlanta suburb of Hapeville in 1946 to continue Ford's industrial presence. Built in 1914, the assembly plant is a four-story, rectangular industrial building. The north and west sides are veneered with face brick and trimmed with terra cotta and colored tile. On the south and east elevations, the concrete frame is respectively faced with common brick and left exposed. Character-defining windows, which occupy much of the plant's wall surface, are large, multi-paned, metal, industrial sash. The building's finished sides are detailed with brick pilasters between bays and a prominent terra-cotta stringcourse dividing the first from the upper floors. The roof is flat, and from it, project three elevator towers, a water tower, a central gabled clerestory that runs the length of the factory section, and a rooftop office or work area located in the southwest corner. Throughout the interior, rows of concrete columns with mushroom-shaped capitals support the concrete slab floors. It is divided into a showroom/office area at the front end on the first floor and a factory area to the rear. The front entrance leads directly into the large, centrally placed showroom, which retains its original plaster walls. An elevator and a stairway finished with marble treads and risers, ceramic-tile landings, and a cast-iron railing are located to the west of the showroom. A heavily reinforced floor along the central portion of the second level supported a rail bed and allowed rail cars to be brought into the building and directly under the craneway for unloading. In 1942, the building was sold to the War Department for use as an Army-Air Force Storage Depot and Offices of the Third Air Service Area Command. Several alterations were made at this time, including partitioning much of the open space and flooring over the light well at both the third and fourth levels. 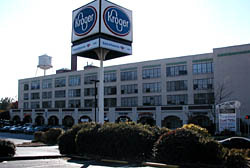 Retail shops and apartments now occupy the building. The Ford Motor Company Assembly Plant, 699 Ponce de Leon Ave., has retail stores on the street level open during normal business hours.